Editor’s Note: The following blog is part one of a four-part series designed to help freelance writers market themselves more effectively in an increasingly crowded field. Over the last few years, marketers have placed a huge premium on insight and expertise in their search for writers. In their view, the perfect writer isn’t just a master story-teller; they are extremely well-versed in a particular industry or topic, and have a proven track record of success. Does this sound like you? Good! Then keep reading. As a writer, these are the types of brands and opportunities that you should be looking for. Forget about the random one-off projects and spec work. These are the types of engagements that can lead to six-figure freelance earnings. And one of the best ways to get found by these types of companies (on nDash or elsewhere) is by crafting a killer bio that puts your personality, experience and expertise front and center. While there is no perfect formula, we don’t have to look far to find some strong examples. The following bios (on nDash, we call these the “About Me” section) were taken directly from a few of our more accomplished writers. Let’s take a look at each and breakdown some of the key takeaways. 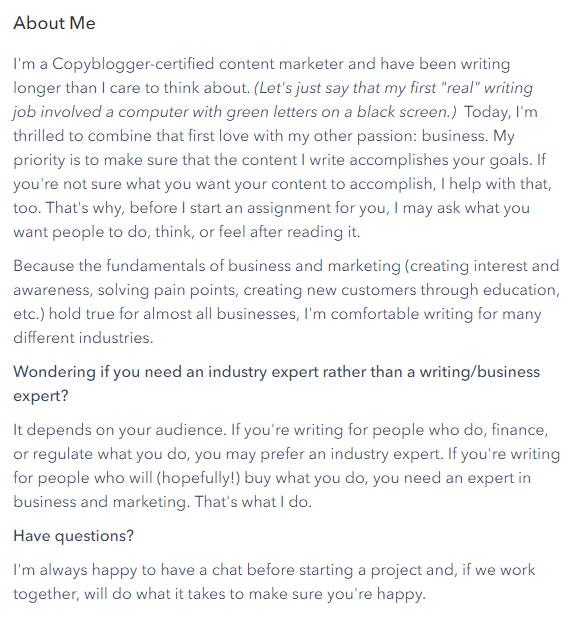 This is a great example of “less is more.” Without going into too much detail, the writers makes it known that he is qualified, focused and eager to work with like-minded marketers. Aside from the great background and proof-points, what makes this writer’s bio stand out is the section on how she works with brands. Some writers price themselves out of certain engagements when they become too strict with rates. This writer has wisely chosen to let brands know that rates can be determined on a per-project basis, leaving room for flexibility and increasing her odds that a brand will opt to work with her. This is a wonderful example of the “story-telling” type of profile. It includes all the important details — brands they’ve worked with, proof-points, portfolio, etc. — but is communicated in such a way that it gives the reader a sense of how they would actually write content for them. This writer does an incredible job of showcasing how she is 100% focused on the client. She makes it her mission to understand what their marketing goals are, and then explains how she will help them accomplish them. Additionally, she is also smart in telling the brand at the end when she will not be the best writer for them, just so that they understand exactly the type of audience she’s an expert writing for. Now, what about a resume? Just like with any other job, it’s equally important to have a resume handy to show prospective clients (on nDash, we call this section “Experience”). Here, be sure you reconfirm your writing expertise by highlighting brands you have worked with in the past. Also, if you did have a career outside of writing (past or present), be sure to highlight that as well. If a brand is in the cybersecurity industry, showcasing that you were a former CISO (for example) will only help your chances of landing a writing gig with their company. Your bio is often the first (and last) impression you make on a prospective client. Keep it tight. Keep it focused. And make sure it tells your story as a writer and the value you bring to the table. (If you’re an nDash writer, now would be a great time to update your profile). 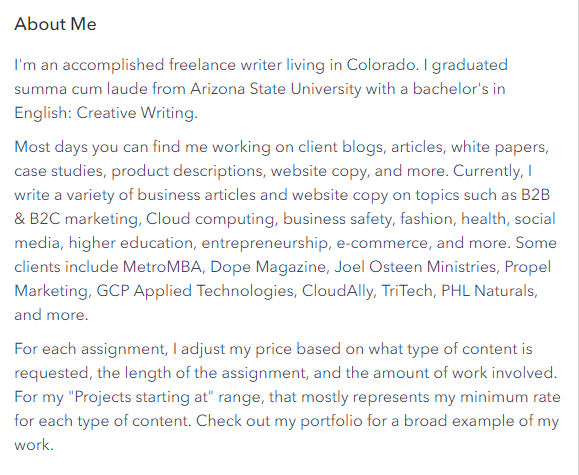 What tips do you have for crafting a bio? Be sure to share in the comments section below!